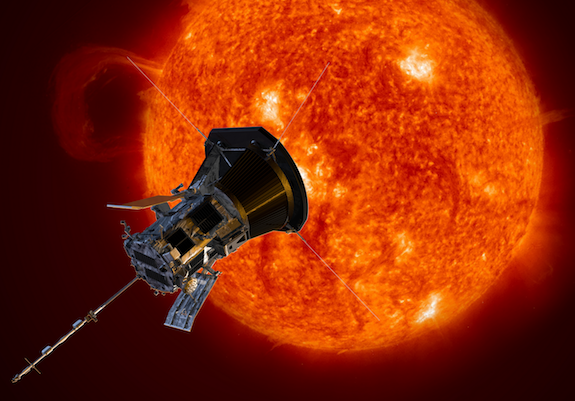 Parker Solar Probe (PSP) is a NASA mission which will soon embark on a daring dive towards our Sun, far closer to the inferno than any previous man-made object. PSP is slated to launch on August 4th, and I have the honor of being the Orbit Determination lead for this historic mission. Check out the official Parker Solar Probe website. 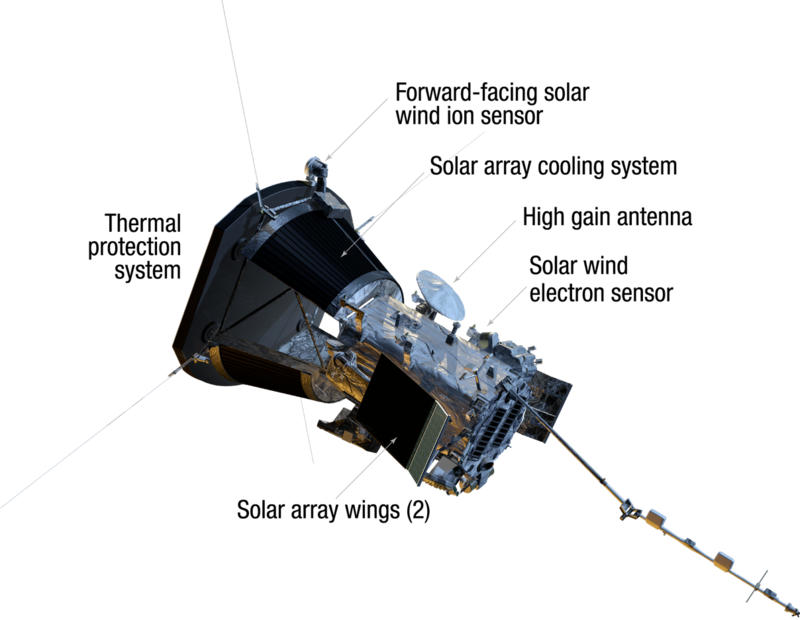 Artist's impression of NASA's Parker Solar Probe. Credit: Johns Hopkins University Applied Physics Laboratory. The solar probe spacecraft will be traveling around 190 km/s (425,017 mph) during closest approach to the Sun (beginning in late 2024). At this speed it would take you a mere 10-seconds to travel from New York City to Kansas City! Speaking of close approaches to the Sun (what we astrodynamicists call perihelia)… PSP gets very close to our star, 22x closer than Earth, and almost 7x closer than Mercury. The diameter of the Sun as seen by the spacecraft will be more than 10x larger than what we see on Earth. 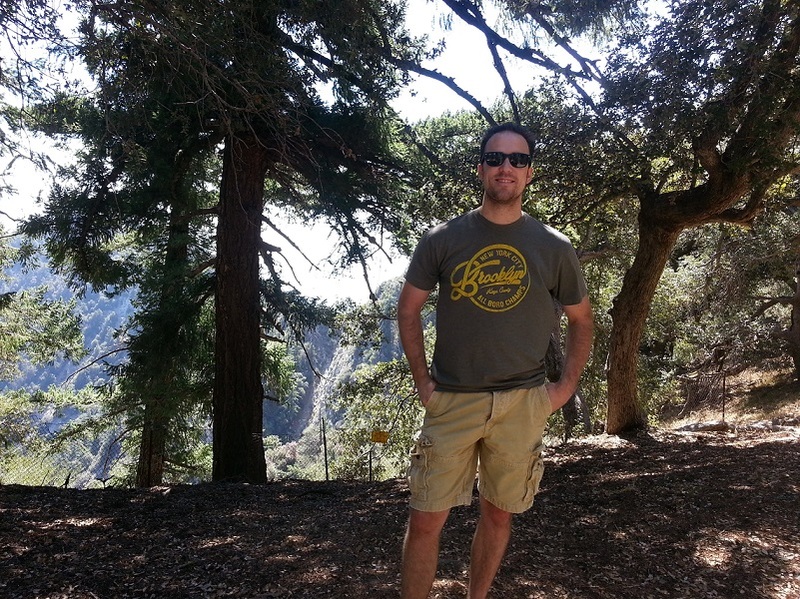 You would need at least 10 thumbs to cover that radiating ball of gas! Thankfully PSP has a large thermal protection system (TPS) to protect it from the hellish heat. Cutting-edge technology was involved in the construction of the TPS, which is effectively a heat shield that the sensitive spacecraft components and instruments hide behind. The front of the TPS will experience temperatures upwards of 2000° Celsius while maintaining components below about 100° Celsius. Parker Solar Probe Spacecraft Components. Credit: Johns Hopkins University Applied Physics Laboratory. Why is the Sun’s corona (atmosphere) hotter than it’s surface? This question (not really a fact at all) happens to be one of the central scientific mysteries PSP aims to understand. The Sun’s core is more than 15 million degrees Celsius, and it cools gradually as you move outward, reaching a relatively chill 6000° at the visible surface. But then strangely the trend reverses and begins heating up. The corona can be 300x as hot as the surface. This is a total enigma and understanding it could help protect us from the increasing threat space weather poses to our technologically dependent society. PSP will be traveling so fast relative to the Sun that the strange effects of special and general relativity become apparent. From the reference frame of PSP, the Sun’s dangerous radiation will appear from a direction which is more than 2.1 arcminutes away from the inertial location of the Sun itself. This effect is known as aberration of light and must be accounted for. Most importantly when pointing the TPS so as to adequately protect the spacecraft. Not doing so would otherwise expose our sensitive instruments. It requires more energy to get this close to the Sun than it does to escape the entire solar system! This is very non-intuitive since the Sun is relatively close to Earth (30x closer than the planet Neptune). To escape the solar system from Earth you need to increase your speed by at least 12.4 km/s (27,738 mph). But to reach the minimum solar distance PSP will achieve requires a speed reduction of 21 km/s (46,975 mph). This revolutionary mission uses seven gravity assist flybys of Venus in order to ‘touch the Sun’. Hence, there are seven facts on this list. Without the gravitational help from our closest neighbor planet, this mission would not be feasible. The flybys, which occur at various altitudes, represent the engine necessary to reduce the orbital energy and the distance to the Sun. 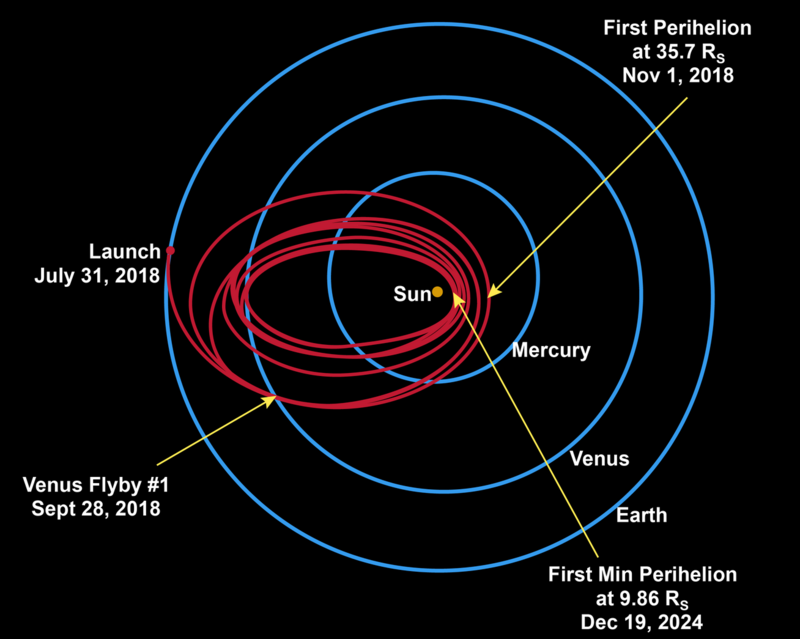 Parker Solar Probe Trajectory. Credit: Johns Hopkins University Applied Physics Laboratory.